What is Local File Inclusion? 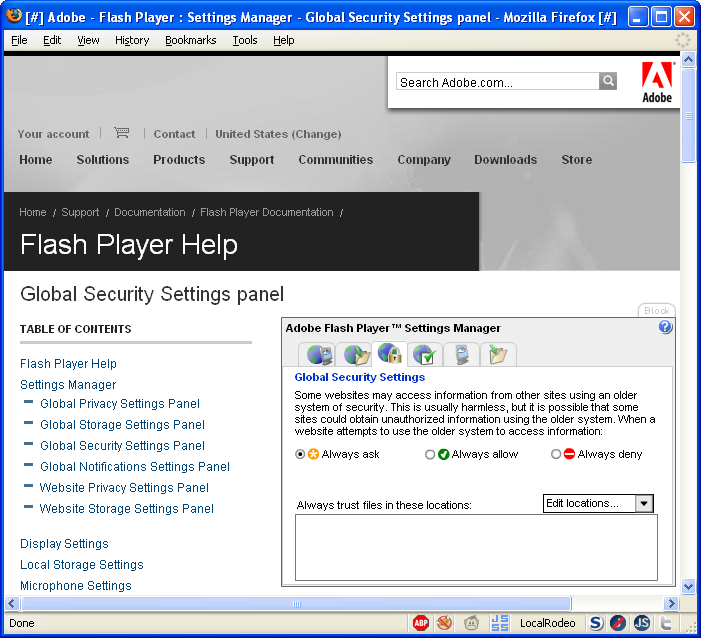 Local File Inclusion (LFI) is the process of including files on a server through the web browser. 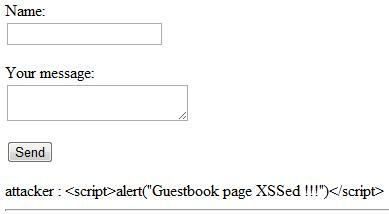 This vulnerability occurs when a page include is not properly sanitized, and allows directory traversal characters to be injected. The repeated ../ characters has caused include() to traverse to the root directory, and then include the Unix password file /etc/passwd. Unix /etc/passwd is a common file used to demonstrate directory traversal, as it is often used by crackers to try cracking the passwords. 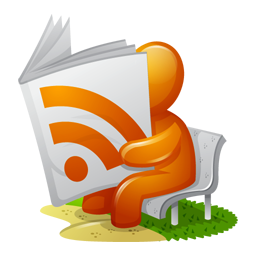 Every now and again, though, the website may output that /etc/passwd/ cannot be found simply because the server is interpreting the location as if it is /etc/passwd.php/. To correct this, we need to apply what is called a Null Byte. This bit of code looks like: %oo (percent double zero). In SQL, it means 0, but everywhere else in coding, it is interpreted similar to a black hole, such as /dev/null/. 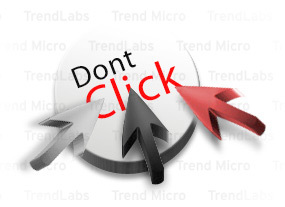 This code eliminates the use of an extension. 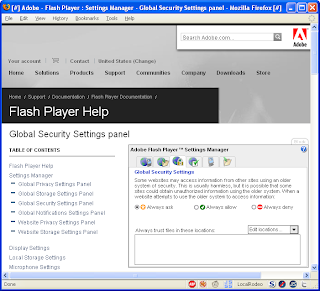 The code would appear as /etc/passwd when entered into the address bar. Most good admins will have protected against the simplest LFI attacks, so we should update the example script accordingly. Ensure that the first N characters of the fully qualified path to the requested file is exactly the same as the 'Document Root'. If so, allow the file to be returned. If not, return an error, since the request is clearly out of bounds from what the web-server should be allowed to serve. 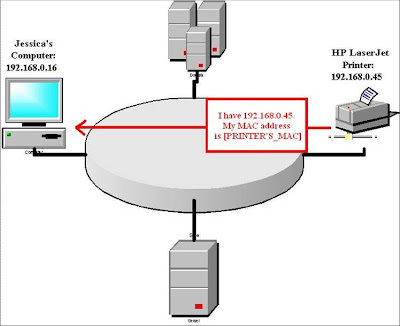 Running malicious code on the server: any code in the included malicious files will be run by the server. If the file include is not executed using some wrapper, code in include files is executed in the context of the server user. This could lead to a complete system compromise. The first line of code extracts the value of the page parameter from the HTTP request. 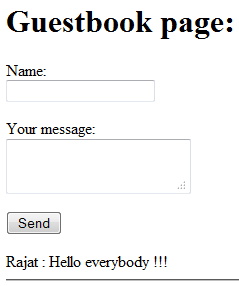 The second line of code dynamically sets the page name to be included using the extracted value. 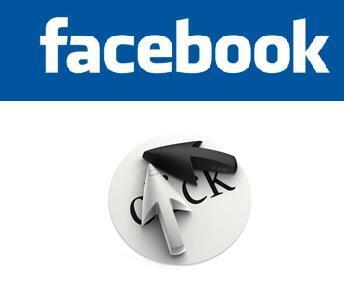 If the web application does not properly sanitize the value of the page parameter, this code can be exploited. 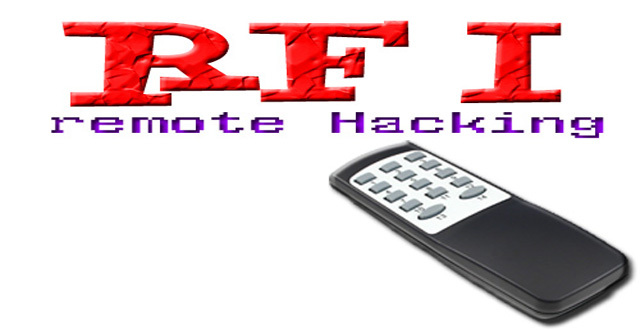 Thus, the remote file will be included and any malicious code in it will be run by the server. 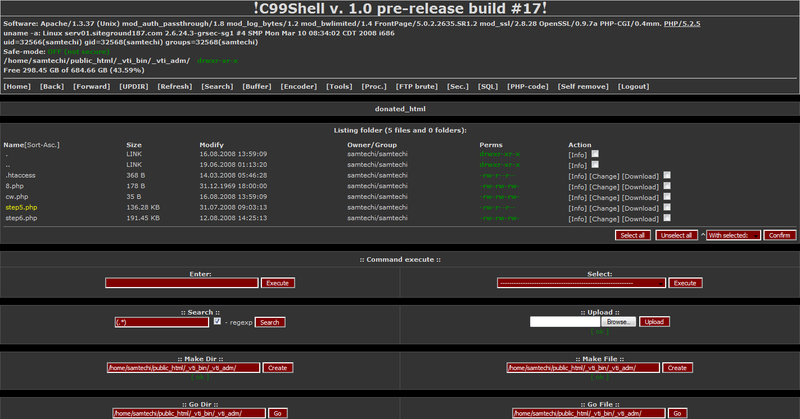 Most popular of them are c99 or r57 shell which allows an attacker to browse the filesystem, upload, view, and edit files as well as move files, delete files, and even change permissions, all as the web server. 1. Advanced knowledge of RFI attack sources enables the WAF to block an attack before it even begins. 2. A blacklist of the referenced URL enables the WAF to block exploits targeting zero-day vulnerabilities of applications. 3. 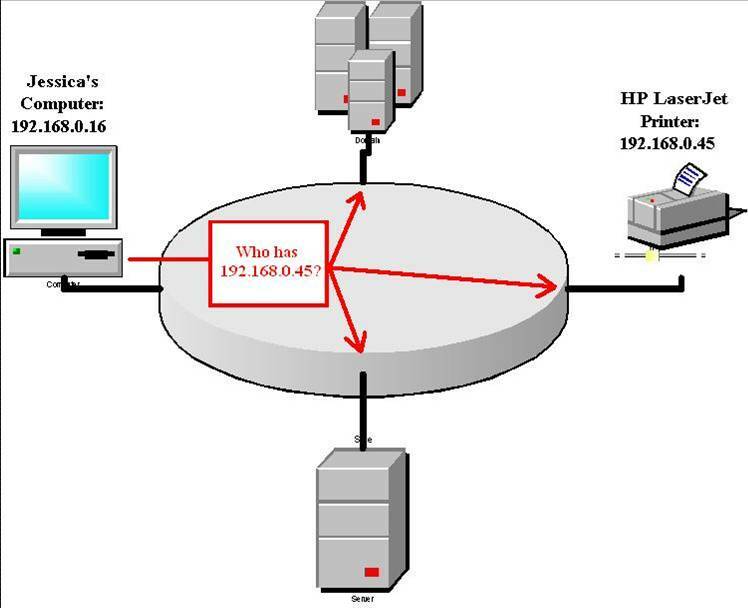 The blacklist of IPs constructed from the RFI attack observations could be used to block other types of attacks issued from the same malicious sources. How does the attack begin ? Reconnaissance or Footprinting is consideredthe first pre-attack phase and is a systematic attempt to locate, gather, identify, and record information about the target. The hacker seeks to find out as much information as possible about the victim. Some hackers might dumpster dive to find out more about the victim. Dumpster diving is the act of going through the victim's trash. 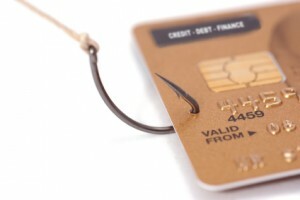 Another favorite of the hacker is social engineering. 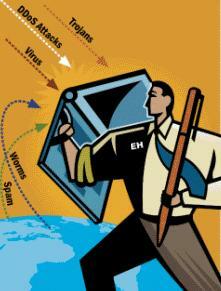 A social engineer is a person who can smooth talk other individuals into revealing sensitive information. This might be accomplished by calling the help desk and asking someone to reset a password or by sending an email to an insider telling him he needs to reset an account. 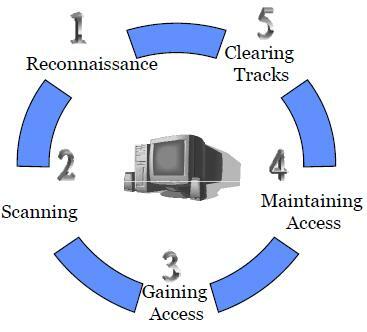 Scanning and enumeration is considered the second pre-attack phase. Scanning is the active step of attempting to connect to systems to elicit a response. Enumeration is used to gather more in-depth information about the target, such as open shares and user account information. 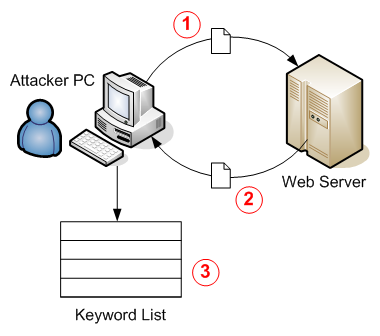 At this step in the methodology, the hacker is moving from passive information gathering to active information gathering. 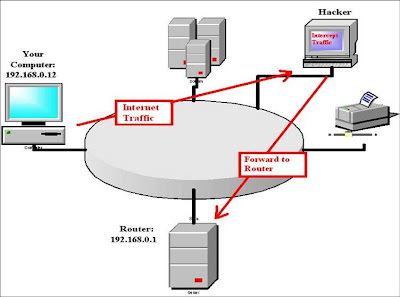 Hackers begin injecting packets into the network and might start using scanning tools such as Nmap. The goal is to map open ports and applications. Unlike the elite blackhat hacker who attempts to remain stealth, script kiddies might even use vulnerability scanners such as Nessus to scan a victim's network. As far as potential damage, this could be considered one of the most important steps of an attack. This phase of the attack occurs when the hacker moves from simply probing the network to actually attacking it. After the hacker has gained access, he can begin to move from system to system, spreading his damage as he progresses. Access can be achieved in many different ways. 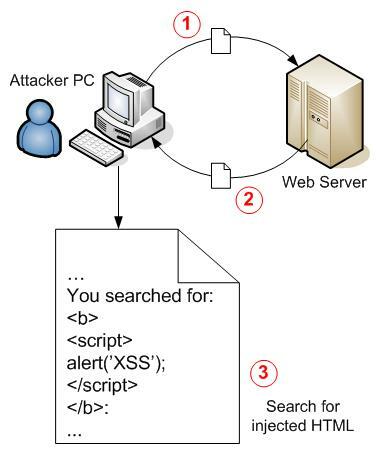 A hacker might find a vulnerability in the web server's software or might perform a denial of service (DOS) on that server. If the hacker is really bold, he might even walk in and tell the receptionist that he is late for a meeting and will wait in the conference room with network access. 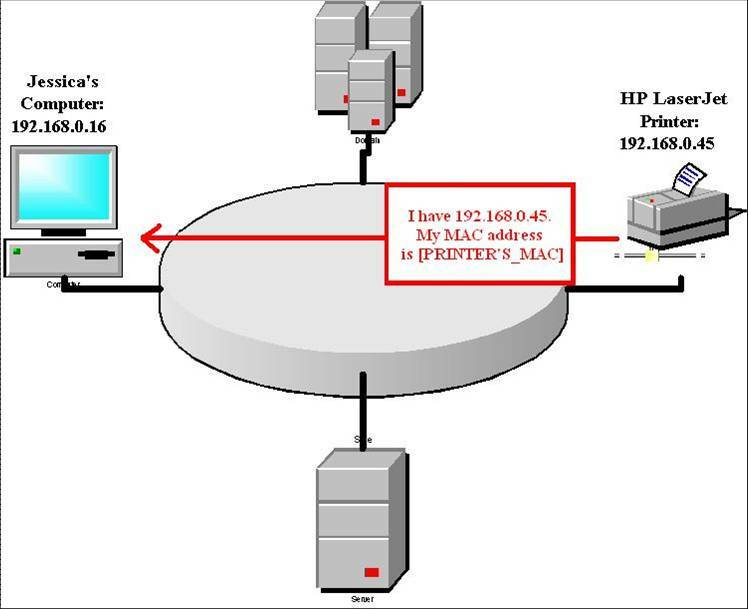 Pity the poor receptionist who unknowingly provided network access to a malicious hacker. Hackers are diligent at working on ways to maintain access to the systems they have attacked and compromised. They might attempt to pull down the etc/passwd file or steal other passwords so that they can access other user's accounts. Rootkits are one option for hackers. A rootkit is a set of tools used to help the attacker maintain his access to the system and use it for malicious purposes. Nothing happens in a void, and that includes computer crime. Hackers are much like other criminals in that they would like to be sure to remove all evidence of their activities. 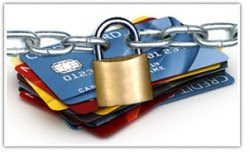 Hackers must also be worried about the files or programs they leave on the compromised system. 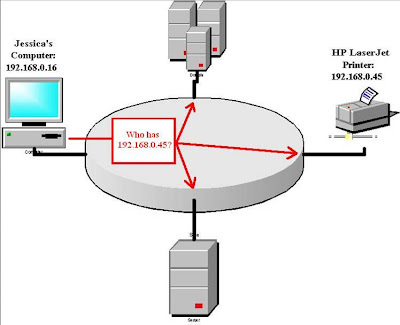 In order that the target company’s security engineer or network administrator cannot detect the evidence of attack, the hacker needs to delete logs files and replace system binaries with Trojans. How do you defend the attack ? In order to defend a hacker, you have to think from his/her perspective. Being an ethical hacker, you will need to be aware of these tools and techniques to discover their activities and to deploy adequate countermeasures. WHAT IS A BLACK HAT HACKER ? 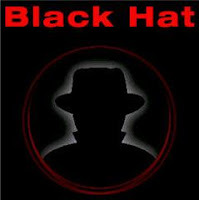 Black hat is used to describe a hacker who breaks into a computer system or network with malicious intent. Unlike a white hat hacker, the black hat hacker takes advantage of the break-in, perhaps destroying files or stealing data for some future purpose. The black hat hacker may also make the exploit known to other hackers or the public without notifying the victim. The black hats are also called the Crackers. Jawad Ehsan, a.k.a HAmza, a.k.a ZombiE_KsA is one of the most wanted black hat hackers or cyber criminals, who had founded the Pakbugs.com. He was basically Saudi Arabia based and was charged with 169 website defacements. In the year 2009, he hacked the GOOGLE Morocco and claimed that was the biggest defacement ever from pakistani hackers. NR3C (FIA) is providing single point of contact for all local and foreign organization for all matters related to cyber crimes. It is imparting trainings and related security education to persons of government/semi-government and private sector organizations. 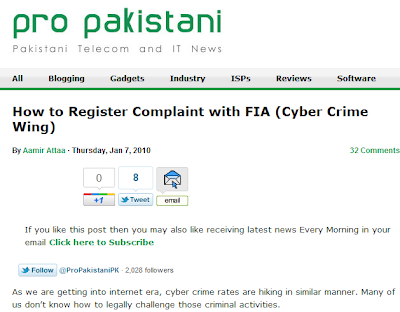 Mr. Aamir Attaa wrote a topic on How to Register Complaint with FIA (Cyber Crime Wing) on a Pakistani Telecom and IT News website. 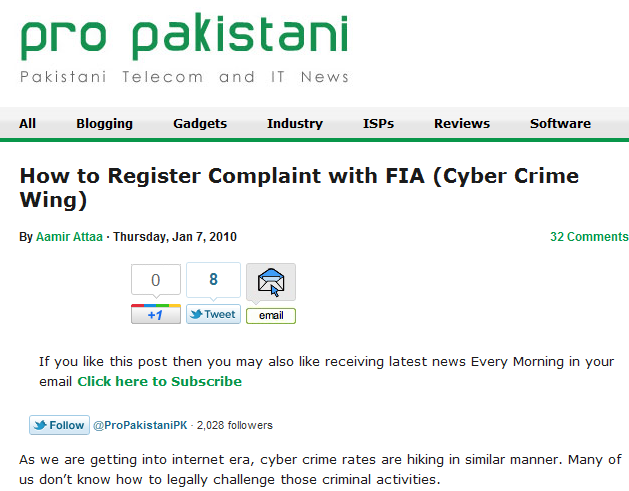 ZombiE_KsA announced on his website that Federal Investigation Department official website, which he had found on propakistani.pk, was owned by Pakbugs. 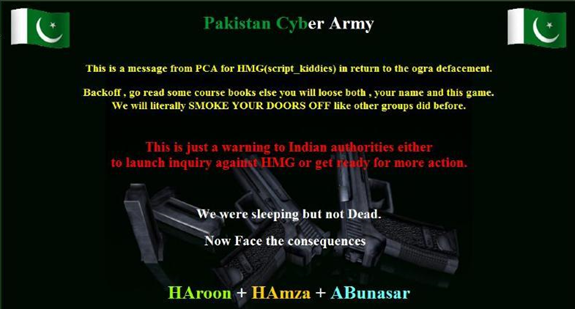 Pakistani Telecom and IT News website announced that Pakbugs hacker’s group was Arrested, including ZombiE_KsA. ZombiE_KsA is active on Pakbugs, even more surprisingly he is working for NR3C. Hope this time FIA/ NR3C is in right, talented hand :) What do you think guys ? Today the war between two nations is fought on cyber space where the bullets are replaced by bytes and the soldiers are replaced by hackers. Cyber security experts say that the cyber war between Indian and Pakistani hackers has grown manifold in the last few years. 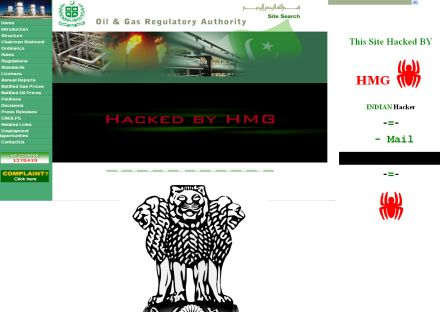 OGRA (Oil and Gas Regulatory Authority, Pakistan) website was defaced by a group of Indian hackers, called HMG (Hindu Militant Guard). In response, a pakistani group of hackers, called PCA (Pakistan Cyber Army) hacked the ONGC (Oil and Natural Gas Corporation Limited, India) website. In a message posted briefly on the ONGC website, PCA said the hacking was carried out in retaliation for the hacking of the OGRA website. "Back off, go read some course books, else you will lose both, your name and this game. We will literally smoke your doors off like other groups did before." said the message from PCA. The fight between Jawad Ehsan/ HAmza/ ZombiE_KsA (founder of PAKBUGS.COM) and r45c4l (leader of Indian Cyber Warriors, ICW, ANDHRAHACKERS.COM) took the higher magnitude. After a meeting, all of the three groups agreed not do deface each other’s websites. It all happened when people from these groups realized that there is no use of such defacements and they should be instead involved in constructive work. Apart from that , poor defaced organizations suffer from these activities. 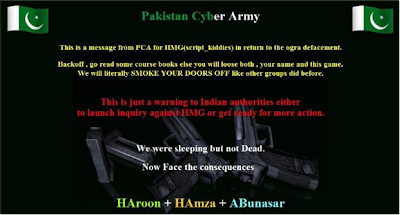 Me r45c4l, on the behalf of ICW likes to make a statement that after a series of defacing each other’s government websites, we as well as PCA and PakBugs feels that this is not going to solve any problem and the things will only gets worse. the guys from ICW, PCA and pakBugs are all very talented and instead of harming each other we can help each other to tighten the securities of our sites and servers. So after a discussion with all ICW,PCA and PakBugs members, we would like to announce that we all quite this here and we will not hack each other’s sites. From now on if any one hacks any sites/servers or claims the hack to be done by either ICW or PCA or PakBugs, we will not be responsible for this. We all r sorry for the trouble and inconvenience caused by all of us. Time passed, but the war did not stop. Some of them are arrested, some are still invisible. The defacements are still in progress. So website administrators, please tune up your security, and make sure that you give tough time to hackers rather than just a minute to deface them.